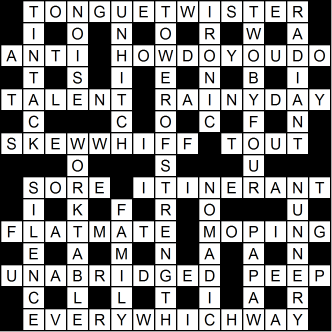 You need Java enabled to view the crossword applet. If you do not have Java installed you can obtain it from java.com. If do have Java you may need to check your security settings to make sure that applets are enabled, especially if you are viewing the puzzle from your hard disk. In Windows XP you may be able to enable the applet by clicking on the yellow bar at the top of the window and selecting “Allow blocked content”. Copyright © 2011 Rupert Morrish. rupert@morrish.org. Web page created by Crossword Compiler. Copyright © Rupert Morrish rupert@morrish.org. Web page created by Crossword Compiler. 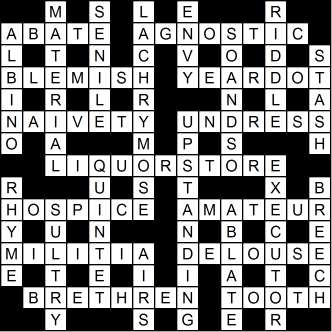 Guardian Crosswords Some of the best cryptic crosswords in the world, free daily!